Buster on the big screen: a visit to the delightful Time Cinema | Silents, Please! 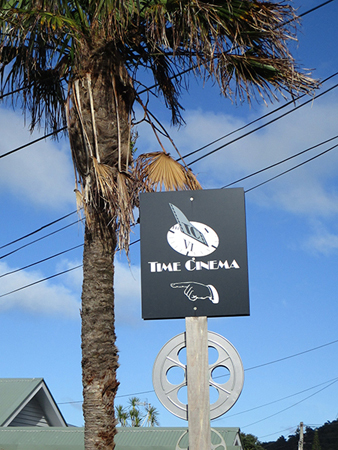 ‘Yesterday again today’ is the slogan for the Time Cinema, one of Wellington’s true hidden gems. 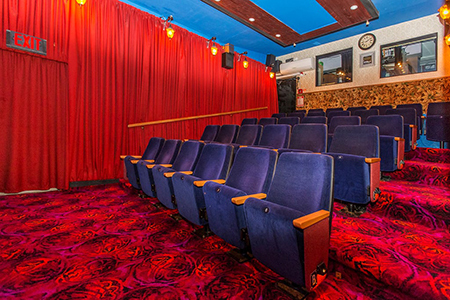 Located in the suburb of Lyall Bay on Wellington’s south coast, what looks like a typical suburban house turns out to include a 39-seater cinema out the back, along with a large lobby housing the Time Cinema’s museum displays. As well as hosting private functions, the Time Cinema runs screenings four times a month on alternating Wednesday and Saturdays. Generally, the films shown come from the Cinema’s own collection of film prints, and the programming is heavy on American titles from the 1950s and 1960s. The screenings also often include a newsreel or other short from the NZ National Film Unit (NFU; 1941-1990), the governmental film-making body that issued regular newsreels between the early 1940s and early 1970s. However, the Time Cinema’s museum displays are just as big as an attraction—maybe an even bigger one. 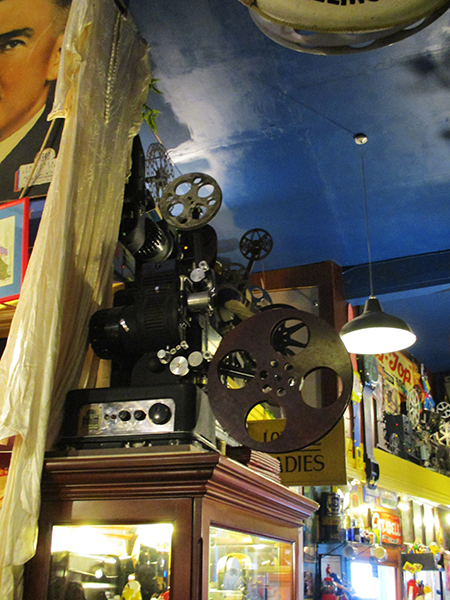 Floor to ceiling, almost every wall in the L-shaped lobby space is crammed with vintage film equipment and cinema memorabilia: projectors, film posters, cameras, splicers, books, interesting knick-knacks, a Steenbeck, even a little cabinet entirely devoted to film cements. There are a bunch of nods to local film culture, too: a lot of equipment here is ex-PRP or ex-NFU, a platterised print of The Return of the King hugs the wall in a corridor, and the Penthouse Cinema‘s former analogue projector stands in the main lobby. I’m a huge nerd about film technology and even have a small collection of my own items, so this kind of place is a dream to me. 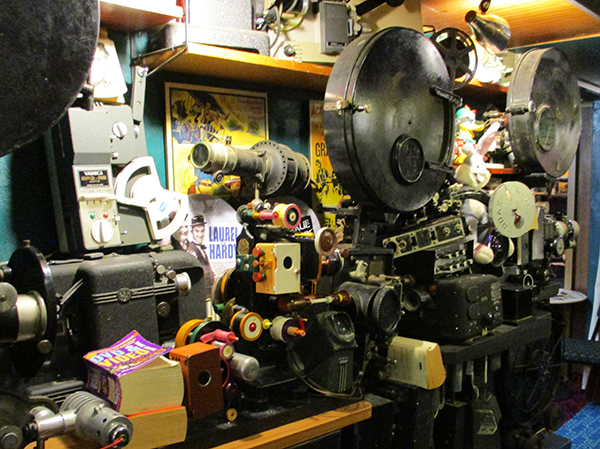 It’s not all film-related: for example, there’s a whole cabinet dedicated to obsolete phone technology, and a large shelf of wax cylinder recordings. And everything is bundled together with a healthy dose of Kiwiana so gloriously tacky that only a local can truly appreciate it. Vintage Tip Top signs! A floor covered in 1980s AirNZ carpet! There’s lot of weird and fun stuff, like how in one corner ceiling a person-sized stuffed Pink Panther is hiding behind a bunch of projectors. Oddly enough, my family had the same Pink Panther toy when I was a kid. 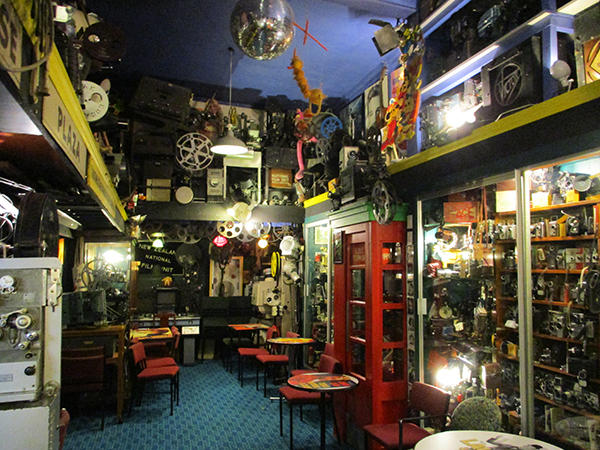 The Time Cinema was founded almost forty years ago by John Bell, a collector and cinema enthusiast. 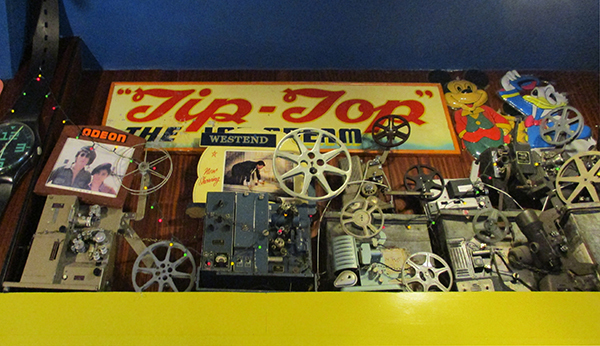 Apparently he started collecting film-related items at the age of eight, and judging by the sheer number of treasures on display at the Time Cinema, it appears that he didn’t really stop until his recent retirement. The museum is orderly—and things are secured pretty well, in deference to the fact that we’re in earthquake country—but it’s a lot. This is the most wonderful kind of cabinet of curiosities. As the pictures show, the Time Cinema really is like a stroll back in time. It’s the kind of place where screenings have an intermission, during which you are served sausage rolls, lamingtons, and cups of tea in those once-ubiquitious glass mugs. Last Saturday we convened for a double-bill of Buster: Cops (1922) and The Navigator (1924). Cops was presented in a watchable but rather soft 16mm print, The Navigator was shown digitally. There’s not much I can say about such well-established classics—I’ve seen them both several times before, but it’s been a few years. Buster does some of his best work in these films, so if you haven’t seen them, stop what you’re doing and watch them right now! They’re both fantastic! (Okay, with the caveat that The Navigator is marred by the section with the ‘island natives’). The excellent piano accompaniment was provided by David Beattie, who compiled bespoke scores for each film from music of the era. 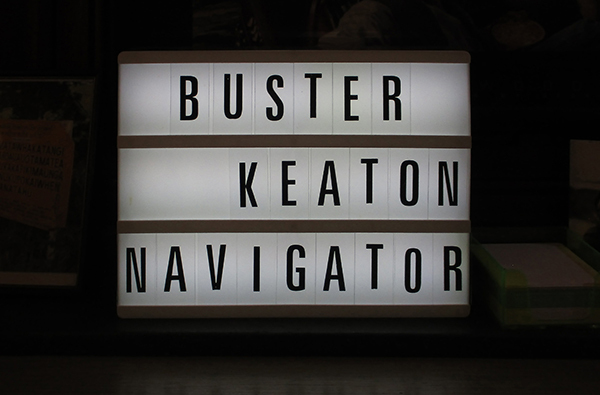 David’s deep knowledge of Keaton’s films was evident—his piano playing was perfectly calibrated to the images, with all the accents on Buster’s pratfalls flawlessly timed. Music and silent film is part of David’s heritage; during his introduction to the screening, he explained that his grandmother had been a silent film accompanist in the 1920s, in the South Island town of Oamaru (which, incidentally, is the steampunk capital of Aotearoa New Zealand). Her portrait sat atop the piano during the screening. David fell in love with silent film when he saw Murnau’s Sunrise (1927) back in the late 1970s and it seems he never looked back. We had a nice yarn during the intermission too, it’s always great to meet a fellow silent film nerd. 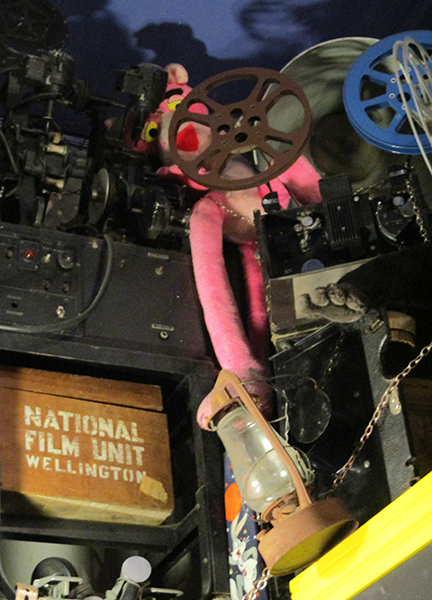 Wellington is the film capital of Aotearoa: most of our film industry is based here, and companies like Weta (special effects) and Park Road Post (post-production) are internationally reputed; it’s also home to ANZ’s national audiovisual archive, Ngā Taonga Sound & Vision. 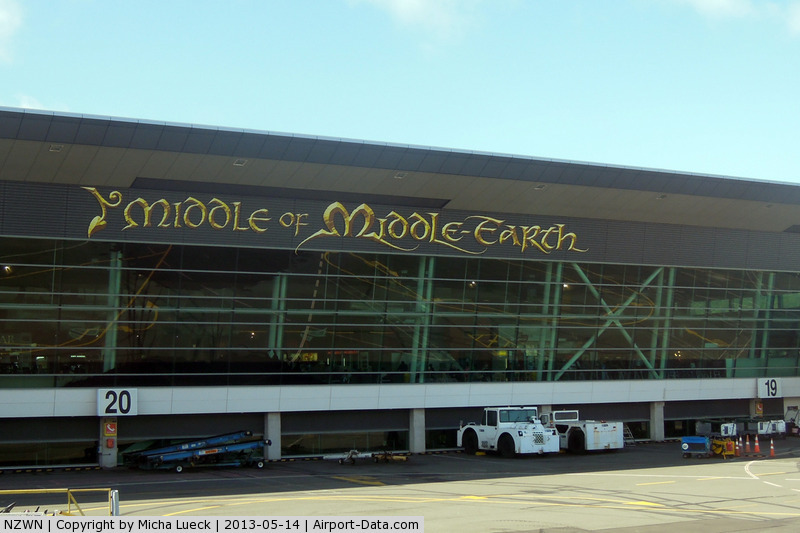 And of course, we did not escape the Lord of the Rings marketing blitz. However, the Time Cinema is not that well-known—even some of my most film-loving friends had never been before the Keaton screening. (In fact, this was only my second outing there, even though I first visited two or three years ago, when a friend celebrated her birthday there). Later this year the Time Cinema will go silent again for a screening of Gli ultimi giorni di Pompei | The Last Days of Pompeii (IT 1913), starring my gal Fernanda Negri Pouget. I’m already looking forward to it! This entry was posted in Live cinema and tagged Buster Keaton, Live cinema. Bookmark the permalink.